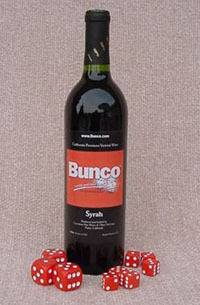 Bunco's Syrah wine made especially for you. Long underrated, this wine's ranges of subtlety defies imitation. Within its ruby red texture are contained a predominantly vine-berry essence which is enhanced by undertones of cocoa/chocolate and a hint of tobacco. These harmonies of opposites lend it an intriguingly unique character, which is fully realized when allowed to breathe an hour before tasting. It's excellent balance allows it to lazily caress the tongue and complement even the finest meal. To benefit from the positive effects of wine one must have a motto of not to much and not too little. Depending on the individual’s body weight and the difference in sexes must both be considered? Moderate consumption is considered to be two to four glasses of wine a day. A man weighing 180 pounds has a lower concentration of alcohol in his blood than a women weighing 120 pounds after drinking the same amount of alcohol. Regular intake is also very important: Recommended level of two to four glasses a day is not intended to be averaged out across a number of days. In other words, drinking no alcohol at all during the week and then consuming large quantities at the weekend, is not advisable if you want to exploit the health benefits of wine. In addition wine should be drunk with food and not on an empty stomach.